So, the building will soon begin again at Eutopia. The cafe will be closed for as long as it takes them to lovingly mosaic, plaster and paint the courtyard, as well as a lot more by the sound of it! They have carte blanche from me – now it’s their turn to build the dream and extend it! Just in case, I have retained the rights to design other eutopia ferrocement-featured cafes elsewhere, but whether that happens depends on who may want to run a cafe with that name and look (not identical to kaiwaka, but designed and perhaps sculpted by me), and whether I can get the time to promote such a creation (writing and jewellery call – see www.silventree.com for what I’m up to in the jewellery line). We now live in whangarei as my mum is in a home and we are visiting a lot, and Raewyn has work here… and, well I ran out of resources to finish the dream. So we are living in sister Rosie’s barn and I have a little studio in the Quarry Arts Centre. The Cafe business goes with it at this price – either can sell separately. Eutopia the land and buildings is a mere $180,000 NZ, or US$147,600. You couldn’t buy the moongate plus giant seagull sculpture alone for that price! 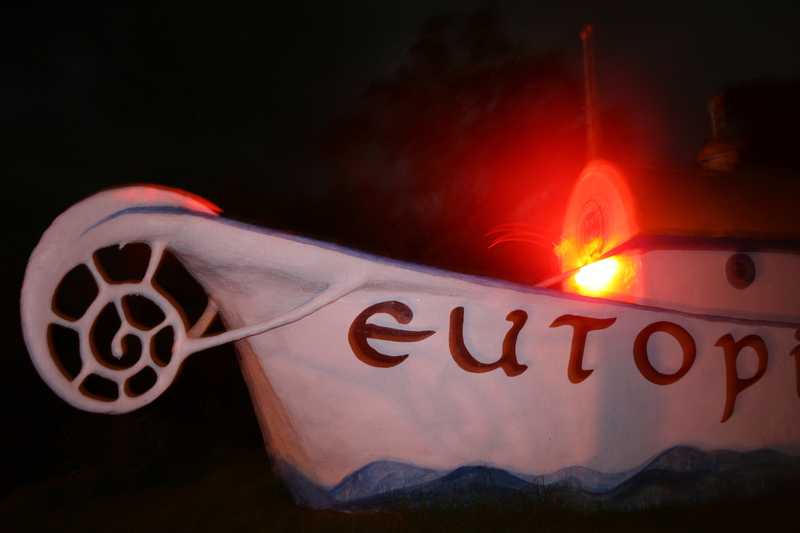 Cafe Eutopia is truly a New Zealand icon, and tourists from all over the world are always photographing it – and uploading pictures and inspired comments on the Web. Google Images has page after page of coulourful photos of cafe Eutopia, most of them uploaded by customers from around the world. Fantastic potential, dreams, visions, inspiring concepts are all here for the right person to take them on and give them new life. spread the word! pin it, post it, attach it. I want the right person to see this….